We are a leading Manufacturer of acetal slat chain conveyor, wire mesh chain conveyor, ss slat chain conveyor, bend chain conveyor, inclined slat chain conveyor and palletized chain conveyor from Pune, India. We offer a range of Acetal Slat Chain Conveyor that cater to the handling and conveying requirements of various industries such as food, bottling and automotive. 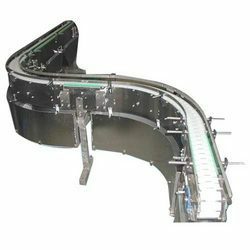 These chain conveyors are fabricated from best quality components which are procured from reliable vendors of the industry. Our range of conveyors are widely appreciated for precision functioning and longer service life. 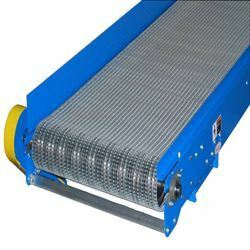 We are trusted manufacturers and suppliers of Wire Mesh Chain Conveyor that are fabricated using finest grades of stainless steel. 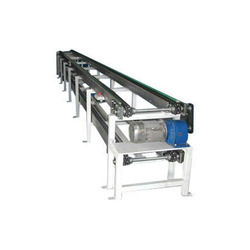 Easy to operate and maintain, these conveyors come in the multitude of dimensions and shapes with accessories. Renowned for robust construction and effective conveying of bulk material, these find wide application in automotive, food and packaging industries. 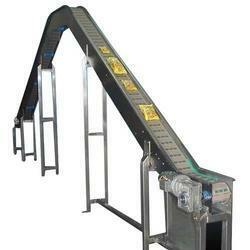 We offer these conveyors at industry leading prices. We provide a range of SS Slat Chain Conveyor that find wide applications in food, bottling and automotive industries. These chain conveyors are constructed from high grade SS 304 / 316, aluminum and MS with powder coating. These precision engineered conveyors are known for rugged construction, high performance and better durability. Further, we also design these chain conveyors as per the specific requirements of our clients. The Bend Chain Conveyor offered by us are suitable for heavy duty applications of material handling in bottle, automotive and other industries. 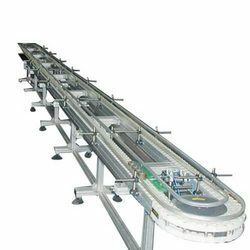 Manufactured using finest quality components, these conveyors are appreciated for flawless construction, optimum functionality and durable performance. Further, these are available in varied specifications to suit the diverse application needs of our clients. Backed by robust infrastructure, we manufacture and supply a range of Inclined Slat Chain Conveyor that are used for material handling purpose in various industries. 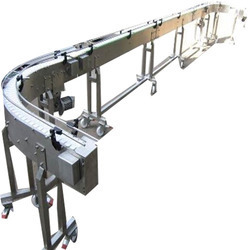 Designed using latest technology, these chain conveyors are high in performance and easy to operate and maintain. Our range of conveyors are available in various dimensions and shapes to meet the diverse requirements of the clients. Our clients can avail from us Palletized Chain Conveyor systems that offer perfect solutions for bulk handling requirements of food industry. Designed with the assistance of our advanced technology, these conveyors are available in two types - single tier palletized chain conveyors and two tier palletized chain conveyors. Offered at industry leading prices, these conveyors are available in customized dimensions in accordance with application requirements. Looking for Chain Conveyors ?